Slightly blackened, so it leaves behind a bit of sooty residue; but it does smoke out well. 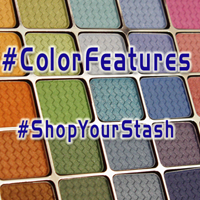 Similar to the old Aromaleigh color Drama Green, but a brighter green and with scattered gold highlights. I thought this color would be a little more neutral but a little brighter, a bit like the colors in the Touch collection. There are some putty-grey tones to this that make my hands a bit red-looking when I wear it. It applies well and the coverage is good, but I don’t know that I’ll reach for it too often. Almost an autumnal bright-rust shade, but it does lean pretty red. The color payoff is excellent, and it doesn’t have too much difficulty mixing with water. If you want a smooth color, this might not be the best choice, because the gold and silver flecks are definitely visible and large enough to be individually distinct.